The manual transaxle has 5 forward gears. This shift pattern is imprinted on the shift knob. The transaxle is fully synchronized in all forward gears so shifting to either a higher or a lower gear is easily accomplished. Press the clutch pedal down fully while shifting, then release it slowly. 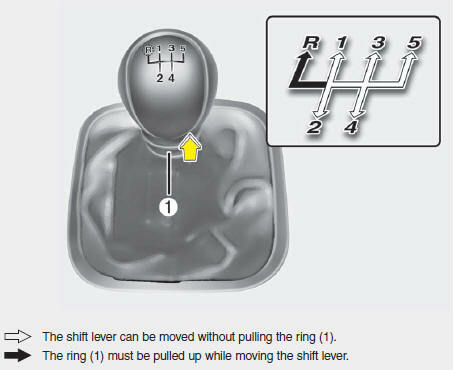 To shift into reverse, rest the lever in neutral for at least 3 seconds after your car is completely stopped. Then move the lever into the reverse position. The clutch should be pressed all the way to the floor before shifting, then released slowly. The clutch pedal should always be fully released while driving. Do not rest your foot on the clutch pedal while driving. This can cause unnecessary wear. Do not partially engage the clutch to hold the car on an incline. This causes unnecessary wear. Use the foot brake or parking brake to hold the car on an incline. Do not operate the clutch pedal rapidly and repeatedly.